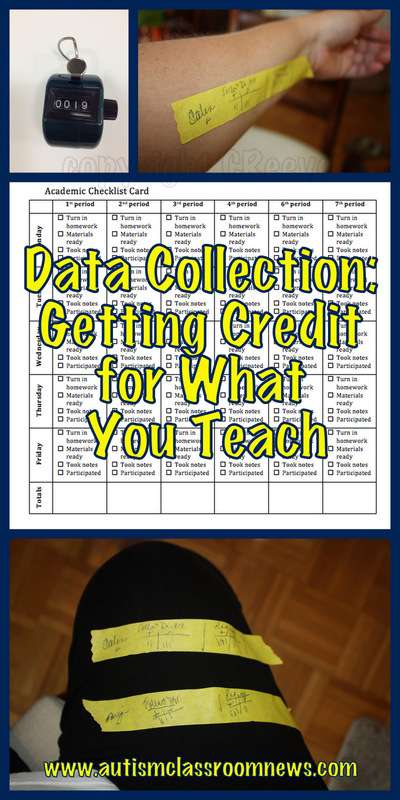 Having talked about all the elements of setting up a classroom, I had promised I would also talk about data collection as the last step. I put data collection as the last step because if your classroom is not organized and running smoothly, you can’t implement instructional strategies. If you can’t implement the strategies, then your data does not help you. So, once you have the students’ needs organized into the daily schedule, the physical environment set up, the visual supports in place, and the instructional materials developed, the last step is putting together the data collection systems. For those of you who don’t know me, I’m a Board Certified Behavior Analyst at the doctoral level who provides consultation to school systems as well as teaching graduate courses. 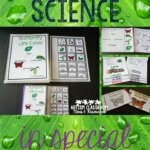 I have run programs for students with autism, done research, and consulted for many years. And because of that, I have to admit this. I LOVE DATA! There, I’ve said it. It’s out there. I can’t deny it anymore. Nonetheless, in all of my jobs and positions, the one thing that I find people have universal difficulty with is how to take and use data in a meaningful way. Those of you who follow the Facebook fan page know that my co-author, Dr. Kabot and I are currently working on our third book which is specifically on data collection and how to take and make use of data in a meaningful practical way. While I can’t share everything that is going into the book (which is turning into a bear, by the way) I can share some strategies and ideas that might get you thinking about your data strategies in your classroom. So, today, I want to talk about 5 tools and ideas to help make data collection practical while still running a classroom and keeping students engaged. While clipboards and data sheets are one way to take data, taking accurate data in real time is more important. 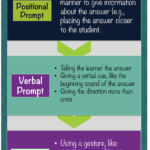 These tools might help to develop methods for collection that allow you to continue to work with the students. But before I start, I have to say one thing. Good data collection starts with good goals. I don’t want to spend a lot of time talking about the need to write strong goals and objectives, but when you have to determine how to take data on a skill that is not well-defined, you realize its importance. A good bit of my professional life, as a director and as a consultant, has involved setting up data collection systems for situations where the goals and objectives might not be that great. For instance, he will behave 75% of the time–not so easy to figure out how to measure. So, you have to have very well-defined skills to be able to figure out how to measure them. Most of you have training about this for IEPs but it really needed to be said in talking about data. No amount of paper, system, or tool is going to save you if your goal isn’t well-written and clear. If you are want me to do some posts on writing good objectives, leave me a note in the comments and I will definitely come back and do so! So, on the fun stuff of tools! 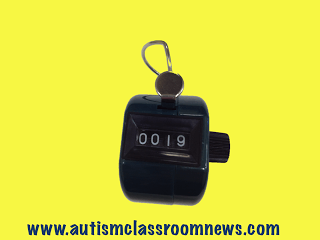 Counters are simple devices that can be used to count simple frequencies of behaviors or skills. 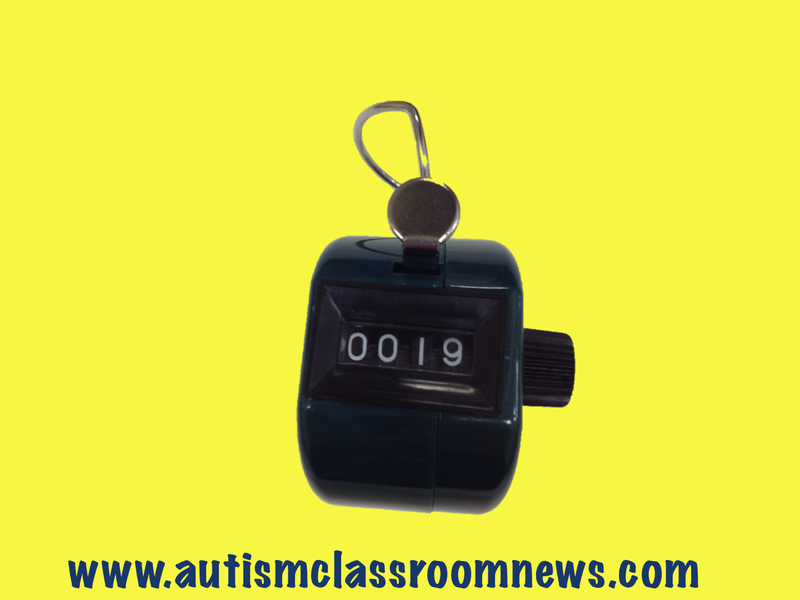 Say you want to know how many requests a student makes; a counter is an easy way to track it throughout the day. Below are some associate links from Amazon that include counters of different colors. Depending on how much you can keep in your head (with me it’s less and less each year), you can use multiple counters to track multiple behaviors or behaviors of multiple students (and I mean skills too when I say behaviors because it’s all behavior). I am not this talented but I have been fortunate enough to work with teachers who are able to track 3 behaviors on 3 different colors of counters at the same time throughout the day. Me, I forget whose counter is whose. However, you have to find a data system that works for you and your team, so this might work for you. There are also a few apps out there that work as counters and lots of places you can get them. Masking tape is your friend for so many things. I apologize for the picture but my arm and leg were the handiest to use. You can put it on your arm or your pants leg and take data directly on the tape. You will have to transfer the data to some other form to summarize it, but this allows you to be mobile. I have talked about this for years in training and it has worked for a number of people. 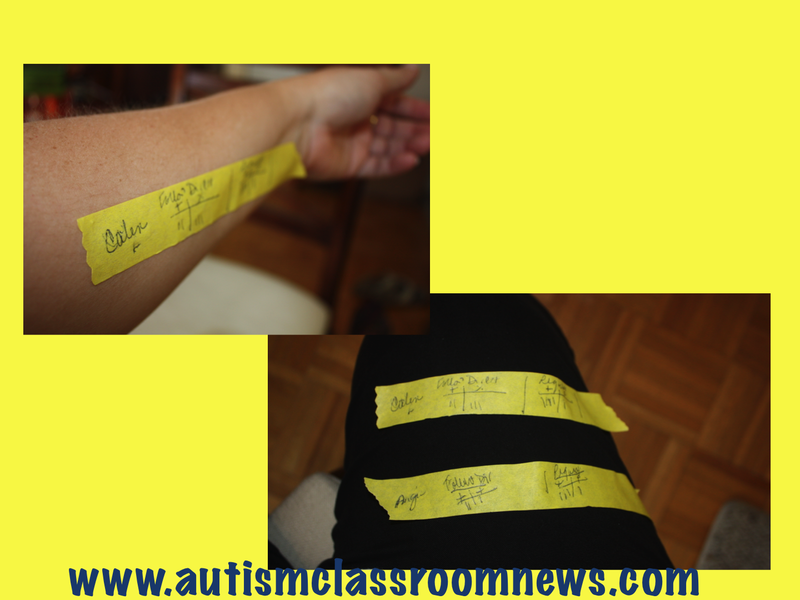 However, the best was a speech pathologist in a preschool who walked in with a wide roll of masking tape. 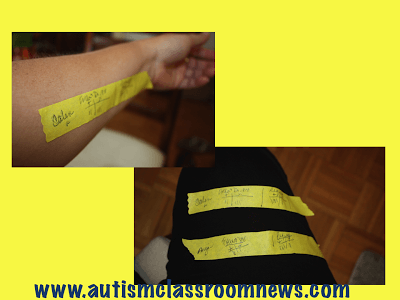 She put 3 pieces on her right leg and 3 pieces on her left leg and proceeded to work with 6 students during her time in the classroom and take data on each of them. It was awesome! As she said, I work with little kids–I can’t hold a clipboard and the materials and keep the running child in place all at the same time. In this picture you can see that I just divide up the masking tape and make tally marks on it for correct and prompted responses. I would use different pieces of tape to denote different skills or students. 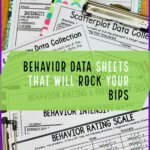 If you are working with higher functioning students, or older students who travel around the school between classes, trying to figure out how to track their behavioral data is really difficult. They typically are in general education settings where there are fewer staff supports to take the data. These are students that we should think about teaching to self-monitor. Travel cards are a way to track specific behaviors by either having the student take data and the teacher check it, or having the student be responsible for making sure that the adult signs off on his or her card at the end of each period. Typically they earn some type of points for their behavior when they turn it in at the end of the day. Below is a simple one I made for a student with 4 specific behaviors: turn in homework, having materials ready, take notes and participated in class. This then becomes the method for tracking his behavior over time and becomes the product that we take the data from to evaluate. I’ve also used paperclips and other tiny manipulatives that you can move from pocket to pocket when you see a behavior. I also use several apps that I will share at some point to track primarily on-task behavior and frequency. And of course I have data sheets that I will try to share a couple of in the next few posts. Then we will also get to the piece of the data puzzle that most classrooms struggle with–summarizing and interpreting the data so you can use it to drive programming. So, how do you take data? Do you have questions or challenges with data collection and analysis that you would like me to explore? I can’t promise I can explore everything and some things, like a lot of my data sheets, are going to have to wait for the book to come out, but we can certainly brainstorm some ideas for how to solve some of the common issues in collecting data and making use of it. So call out in the comments–no need to raise your hand here! P.S. 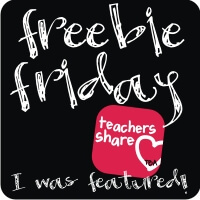 And here’s a freebie for Freebie Friday…click here to download the academic travel card I talked about above. It’s a Word document so you can edit it. Yea data is a universal thing–the only difference is between gen ed and self-contained at times because gen ed typically uses work product and tests and self-contained kids are usually working on skills that need more event-by-event data. I will make sure to have a post about what you need to think about for data collection. I think I'll do that one next. Thanks for reading and for chiming in! Love your blog! 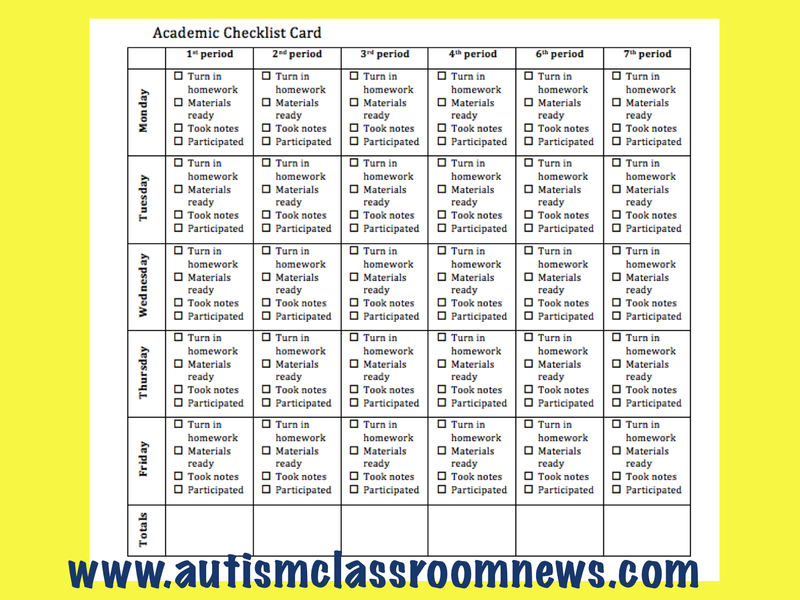 Do you have your academic checklist card available to download on your TPT site? If I can locate the word document, I will put in the next post with the other data sheets I am going to share. thanks! Absolutely I will add it to my list of posts! Thanks for the suggestion! 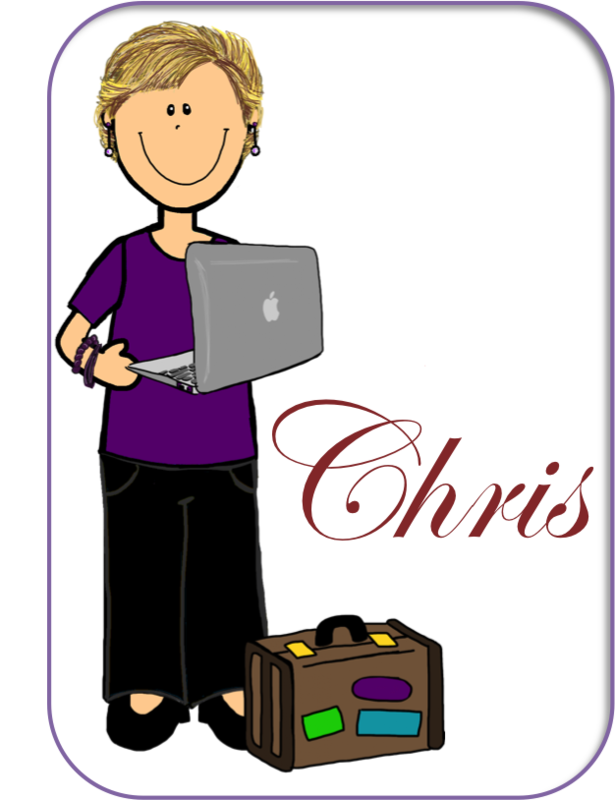 Chris — this is the most amazing site. I consult it 3 -4 times/week minimum! Looking for practical solutions for a teacher to take data on behavioral objectives that require an opportunity to exhibit the behavior — e.g. 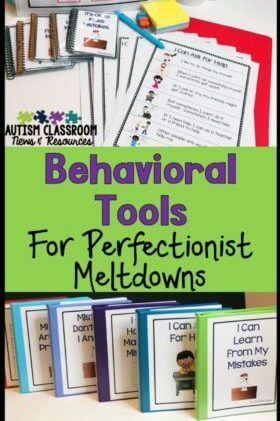 Will comply with redirection following off task behavior 4/5 opportunities, will request help with difficult independent work tasks 4/5 opportunities; Unfortunately, there are several such objectives in the student’s IEP and the IEP has just been signed off. How can the teacher monitor several such behaviors (in addition to all of the academic goals and social skill goals) while still teaching her class? For complying with redirection, you might take a sample of data weekly or twice a week in specific activities in which he is prone to get off task. For the independent work tasks, think about setting up situations in which he will have to ask for assistance–leave materials out and have someone available to support him to ask for them to complete them. Hope that helps.